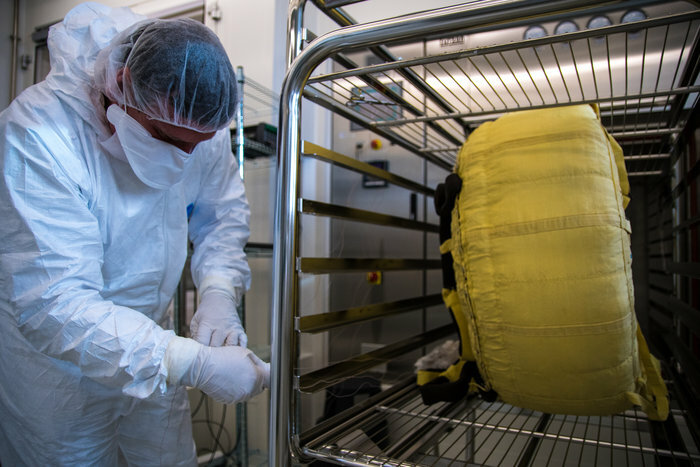 A technician places a nearly 70 kg parachute designed for ESA and Roscosmos’s ExoMars 2020 mission inside the dry heater steriliser of the Agency’s Life, Physical Sciences and Life Support Laboratory, based in its Netherlands technical centre. Mars is a potential abode of past and perhaps even present-day life. Accordingly, international planetary protection regulations require any mission sent to the Red Planet to undergo rigorous sterilisation, to prevent terrestrial microbes from piggybacking their way there. The Lab’s Alan Dowson explains: “This is the ‘qualification model’ of the 35-m diameter main parachute for ExoMars 2020, basically a test version which allows us to finalise our sterilisation procedures ahead of the flight model chute’s arrival. The oven is part of the Lab’s 35 sq. m ‘ISO Class 1’ cleanroom, one of the cleanest places in Europe. All the cleanroom’s air passes through a two-stage filter system. Anyone entering the chamber has to gown up in a much more rigorous way than a hospital surgeon, before passing through an air shower to remove any remaining contaminants. The mostly nylon and Kevlar parachute, packed into an 80-cm diameter donut-shaped unit, was delivered by Italy’s Arescosmo company. This qualification model will now be sent back there for testing, to ensure this sterilisation process causes no change to the parachute’s material properties. ExoMars’s smaller first stage 15-m diameter parachute has already gone through sterilisation using the oven. This is the parachute that opens during initial, supersonic atmospheric entry, with the second, larger chute opening once the mission has been slowed to subsonic velocity. The Lab has also tackled a variety of ExoMars instruments and subsystems, but this second stage subsonic parachute is the single largest item to be sterilised. The sterilisation process aims to reduce the overall mission ‘bioburden’ to a 10 thousandth of its original level.